OK, now there was no question I was hunting for reds, especially Pinot Noir Some of the best Pinot Noirs, in my opinion, if you're looking for cool climate come from the Santa Barbara region. 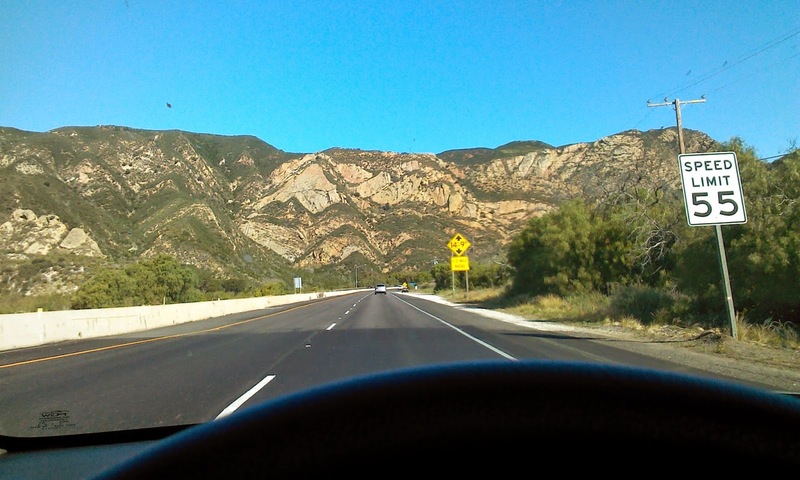 So into the car I climbed, and then wound my way up to the absolutely gorgeous hills of this AVA. Very excited. I might point out, that this was some of the geekiest winemaking in the region. The winemakers here will absolutely appeal to wine geeks. We have single block, single vineyard, whole berry cluster fermentation, the blending of maloactic and unmalolactic fermented wines, and all other kinds of cool, fun wine geek terminology. Best of all, if you like Pinot Noir, Surah, and Cabernet Franc, as well as Chardonnay this is your trip! That said, the wines are, in plain English, fantastic! They taste and feel great! I was headed to Babcock Vineyards. I had tasted some of their stuff before and had been impressed. If you are a wine geek Babcock is a mandatory stop. This place is as geeky as it gets, especially regarding terroir. It was a gorgeous morning and I arrived at 9am. I was busy watching the assistant winemaker and the cellar rats as they went about their business. They could not have been nicer. 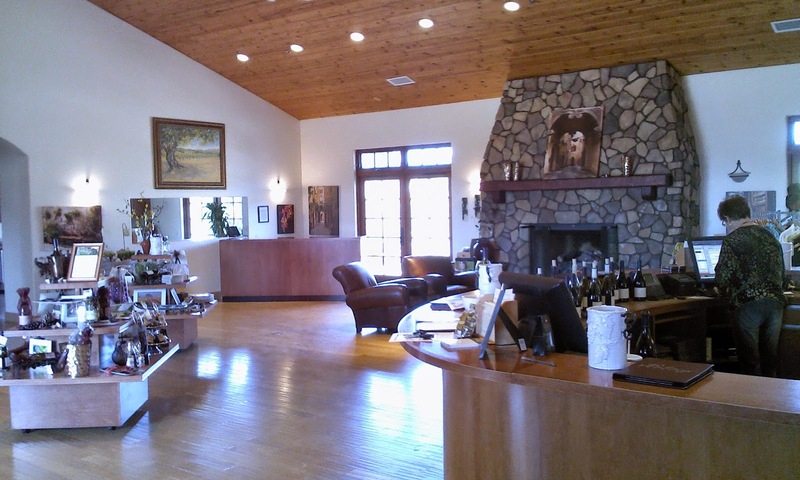 Babcock Vineyards was established in 1978 when Mona and Walter Babcock purchased a 110 acre property on Highway 246 between Lompoc and Buellton in the western Santa Ynez Valley. At the time, the Babcocks were in the restaurant business, as they are to this day, being the proprietors of the legendary Walt’s Wharf in Seal Beach California. 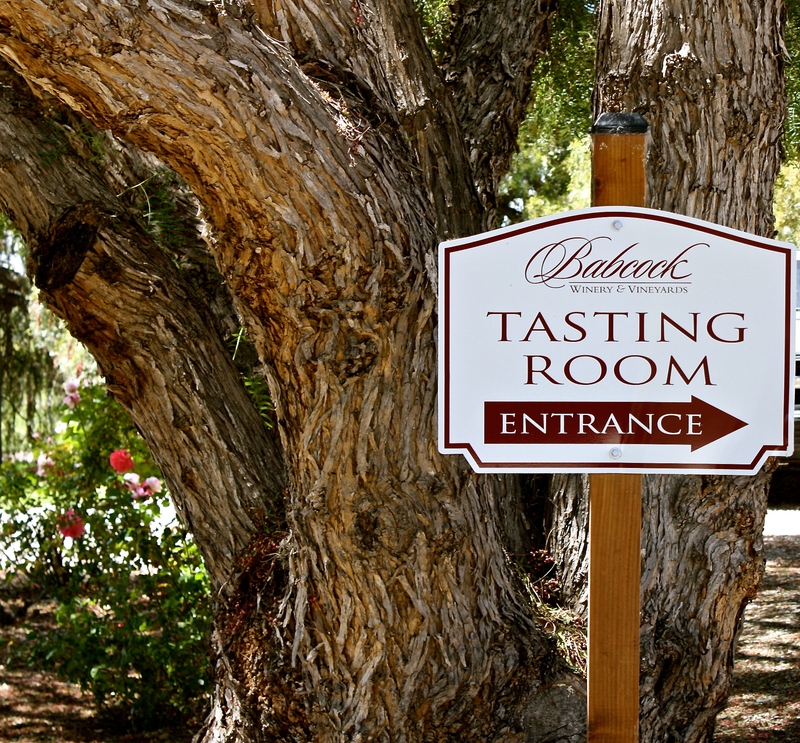 Still family-owned and operated, Babcock Winery and Vineyards is a focused 10,000-case winery with 65 acres currently planted to Pinot Noir, Chardonnay, Sauvignon Blanc, and Pinot Gris. 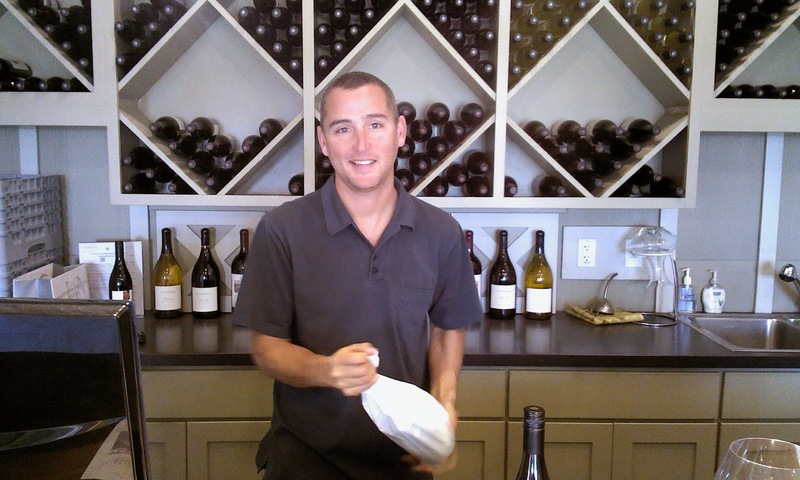 Their son, Bryan Babcock was selected by the Los Angeles Times as one of the "Ten Best Winemakers of the Year." At the time, Bryan was a typical California kid on the verge of adulthood. "I was a sophomore at Occidental College. I didn't really know what I wanted to do with my career and my life. I thought I might go on and get an MBA, but I wasn't sure." A few years later, Stanford, Harvard and other prestigious universities helped Bryan refine his career choices. "They all looked at my application and tossed it. I didn't get into any MBA program I tried out for." He decided to enroll in a masters program in food sciences and enology at UC Davis instead. In the meantime, his dad's vineyard was flourishing. Other winemakers who bought Walter's grapes were impressed with the results. "The first wines that came off the vineyard in '82 and '83 were promising," Babcock said. "The gewürztraminer was good, the acids were good, the riesling was fantastic." In 1984, Bryan was scheduled to return to UC Davis to finish his thesis. "I started crushing grapes here instead," he said, gesturing to the undulating landscape around him, now covered with vineyards. 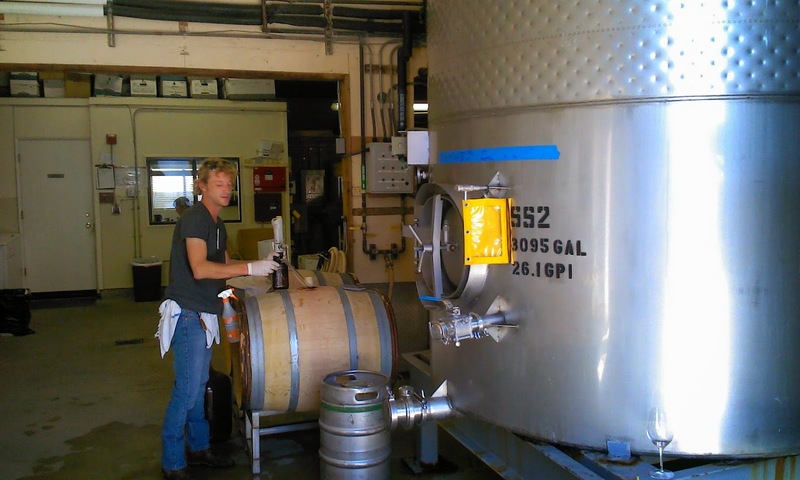 "My dad purchased a small crusher and a presser and some barrels, and we started making wine together. I forgot about school. I've been making wine ever since." The first wine I tried was the Babcock Syrah Identity Crisis 2010. This was a really fantastic wine. A Syrah rose'! Babcock calls it a white because it tastes like a white, but the color is pink. No getting around it. It's got big notes of peach, nectarine, watermelon and a hint of fresh strawberry. A hint of spice to it as well. I loved this wine immensely, and it's a great conversation starter if you're with your geek wine friends. Babcock Pinot Noir Precocious 2010 was a big, meaty Burgundian-styled wine. Dark black cherry dominates, a gorgeous lavender/floral smell is in the offing as are whiffs of caramel and citrus, spice, and a big whiff of dirt! Beautiful fruit up front that lingers for at least 60 seconds, this wine continues to give and give. Layered, textured, balanced. This wine knocked me off my feet! Babcock Ocean's Ghost Pinot Noir 2010 was another astounding wine. Ocean's Ghost is a single vineyard wine, estate grown, in the Santa Rita Hills, using Dijon Clones 115 and 777. "Why the name Ocean’s Ghost for this cuvee?" writes Bryan. "All of the soils on my ranch are the remnants of an ancient sea. From the deep sandy loams in our lower vineyards, to the shallow decomposed sandstone on TOP CREAM’S bench, evidence of the ocean’s touch is everywhere. At various points above our ranch, on steeper hills, in places where erosion has taken away the skin of the mountain, you can see the pitch-white outcroppings of pure diatomaceous earth." Again, big dark cherry, cranberry, red cassis all come through with big whiffs of vanilla, white pepper, and another hint of flowers and earth. The flavors linger and linger, and every ten seconds you're tasting something new. So impressive. 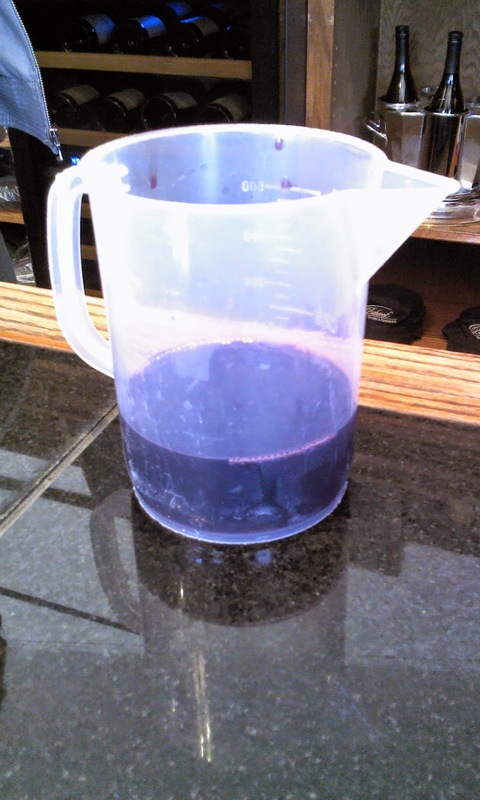 Just then, the assistant winemaker came out with a pitcher of the Babcock Ocean's Ghost Pinot Noir 2011 for the tasting room staff to try. It was a barrel sample obviously. Guess who got a taste? Even bigger bites of dark and bright cherry, with hints of a dark cherry pie. Hints of plum. Smoke Earth. Violets. I loved it!!! Next came Foley Estates. The property was founded by Bill Foley in the late 1990’s. According to their website, Foley’s viticulture and winemaking teams have developed a unique micro-farming program. This complex process involves the mapping of soils and topography down to the smallest increment using soil pits and aerial photography. 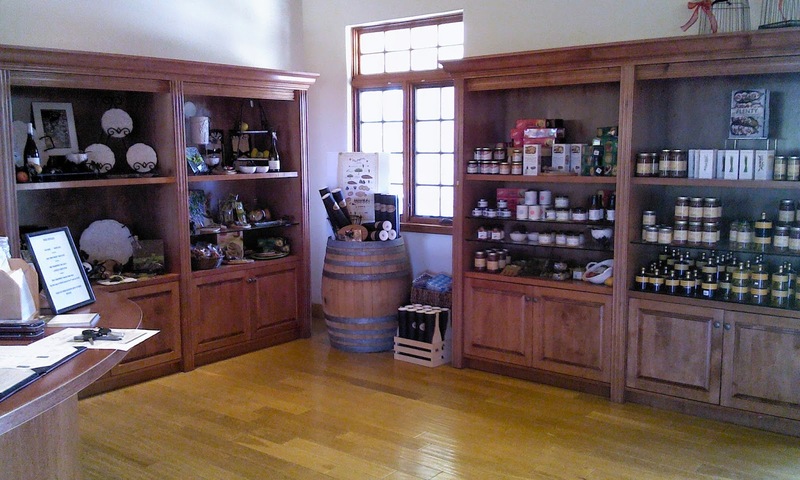 A total of 500 acres are under wine, with an emphasis on Chardonnay and Pinot Noir. 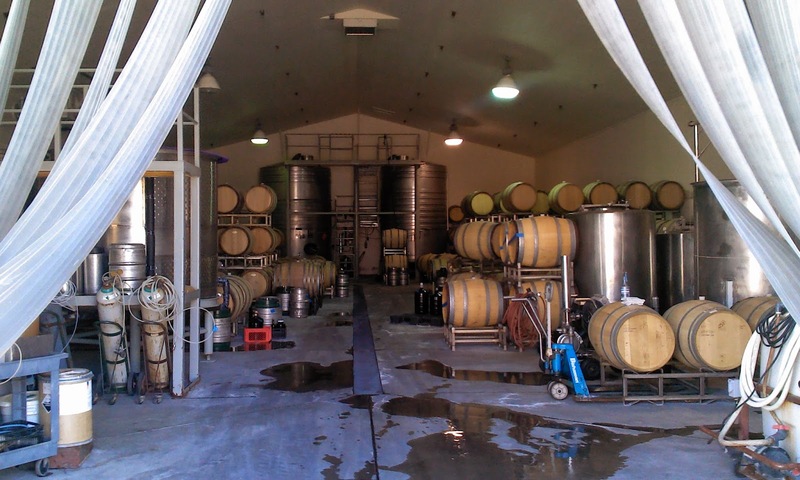 Vintner, William P. (Bill) Foley II, established the Foley Wine Group in 1996, with the acquisition of Lincourt Vineyards in the Santa Ynez Valley appellation of Santa Barbara County. Taking its name from Bill and Carol’s two daughters, Lindsay and Courtney, Lincourt Vineyards quickly established itself as a viable, dynamic brand. 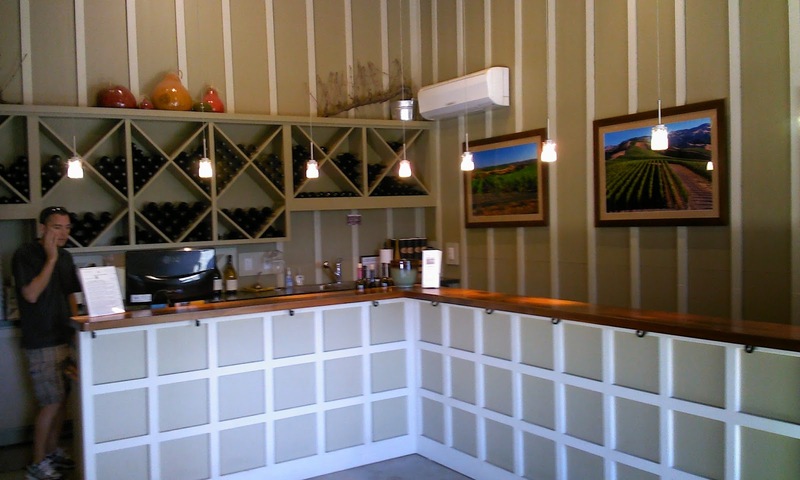 From there, Bill founded Foley Estates Vineyard and Winery, a premiere Pinot Noir and Chardonnay house located in the Sta. 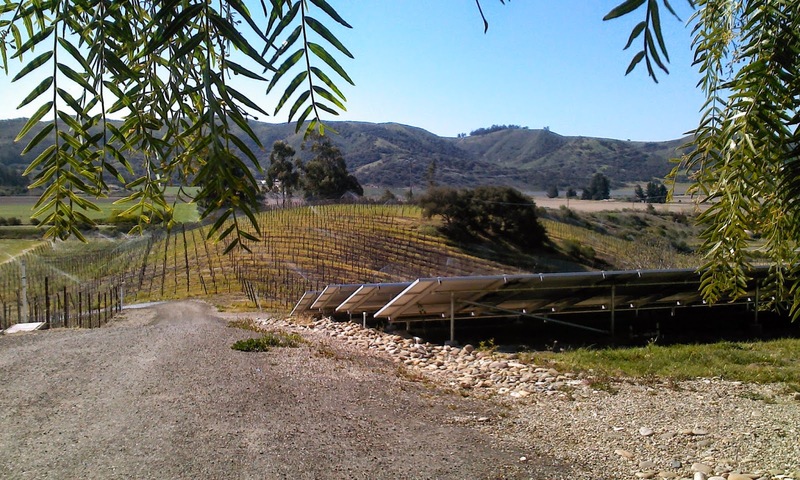 Rita Hills appellation of Santa Barbara County. Foley is as Burgundian in style as one can hope for, and a real treat to taste at. Lorna Kreutz grew up in Fallbrook, California near San Diego. In 2003, she received a Bachelor of Science in Environmental Horticulture Science with a Minor in Agribusiness and Viticulture from California Polytechnic State University, San Luis Obispo. 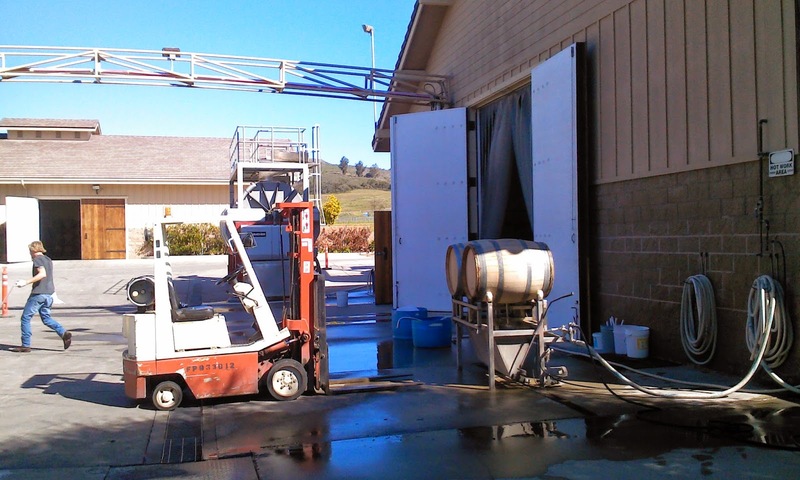 While attending school, she received her first taste of the wine industry through a hospitality position in Edna Valley and was immediately intrigued by the business and ultimately decided to shift into wine production after completing a viticulture internship. Lorna obtained her start in wine production from Longoria Wines in Sta. Rita Hills in 2005. She can still remember the first time she topped a barrel and her early fascination with the synergy of farming, science and artistry that goes into creating a great wine. She also fell in love with the rolling vineyards of the Sta. Rita Hills AVA, and knew she wanted to be part of this highly acclaimed Pinot Noir and Chardonnay wine region. After a few vintages at Longoria as Assistant Winemaker, Lorna decided to return to school to pursue a Bachelor of Science Degree in Enology from California State University Fresno. While in Fresno, she worked in production at Fresno State Winery, receiving her degree in 2008. She then moved on to become Enologist and Assistant Winemaker for Summerwood Winery and Niner Wine Estates in Paso Robles. 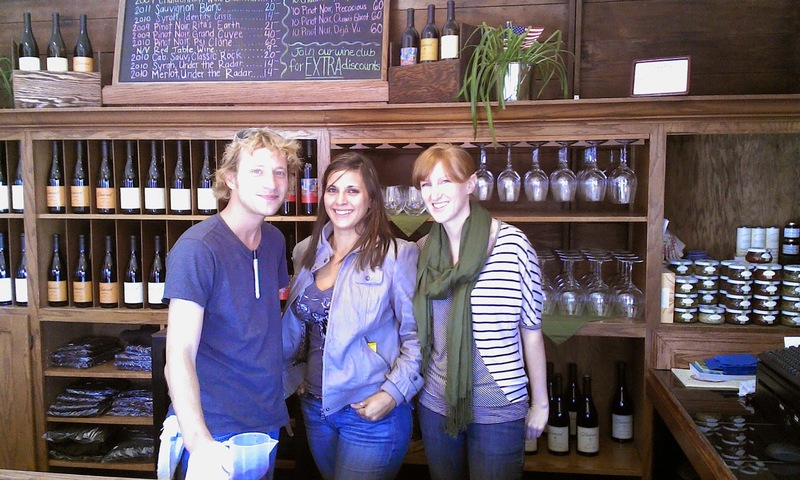 Lorna makes great wines with help from Assistant Winemaker Ryan Aura and the cellar crew. 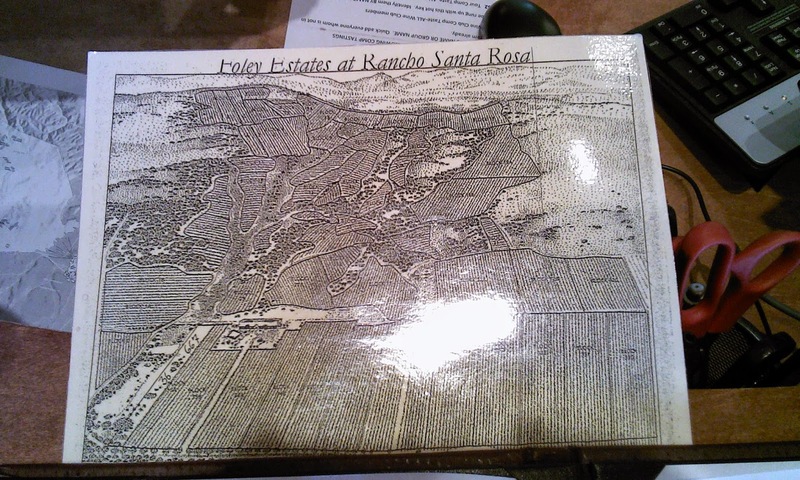 The Foley Santa Rita Hills Rancho Santa Rosa Chardonnay 2009 was an absolutely spectacular wine. Was an instant favorite! This wine was bright and zesty, with crisp apple and pear notes from Snata Rita Hills appellation. A big, full-bodied white. This Chardonnay was fermented in 50% new French Oak and 25% had no malolactic fermentation at all. An odd choice?! The best lots were blended after 16 months in barrel. 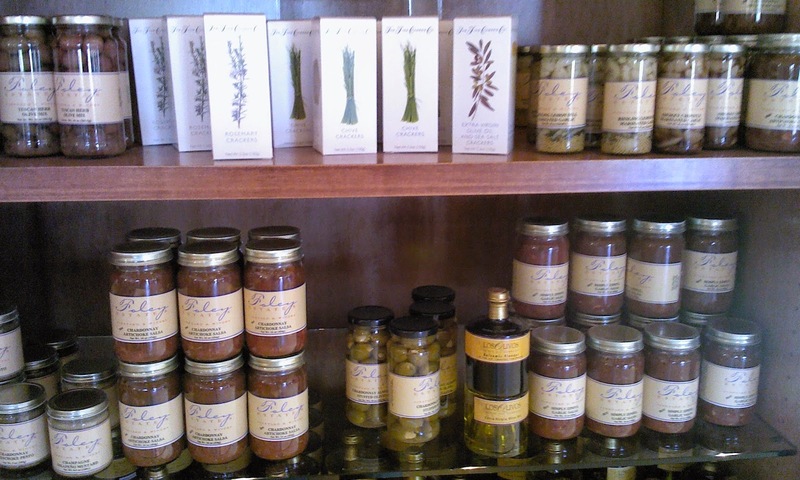 The finished wine displays tropical fruit, stone fruit, and baking spices with a minerally finish. James Suckling awarded it 92 Points in Wine Spectator, writing, "A wine with cooked apple, vanilla, lightly toasted oak and honey. Full and oily. Viscous yet a brightness to it, and vanilla bean aftertaste." Foley "Rancho Santa Rosa" Sta. Rita Hills Pinot Noir 2009 was also an instant favorite. Dark cherry, blackberry, and cranberry all layer one on top of each other with a big spicy nose, lots of white and black pepper, and lots of smoke. All three fruits come across the palate as well. The fruit rolls around in your mouth for good 60 seconds, while it slowly dissolves into lovely tannins and a lip-smacking finish. I really enjoyed the next two wines. First was Two Sisters Lindsay's Vineyard Pinot Noir 2009. 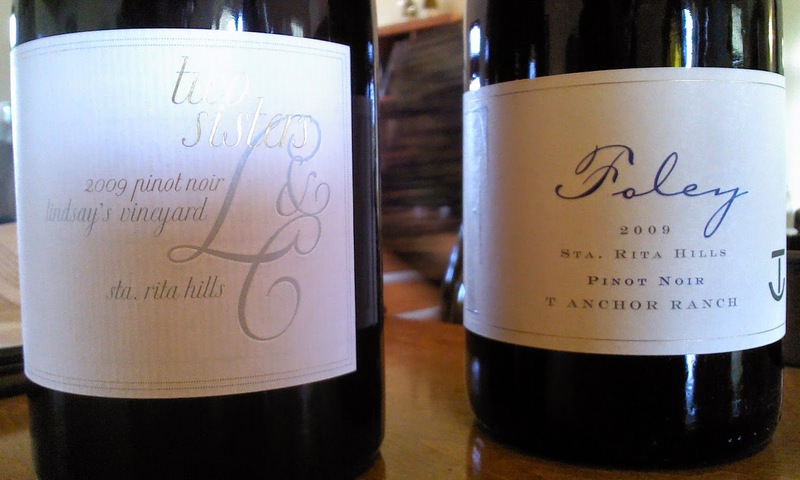 Two Sisters is a limited production line intended to showcase the best Chardonnay and Pinot Noir blocks within Bill Foley's Rancho Las Hermanas Estate in the Santa Rita Hills, from vineyards named for his two daughters, Lindsay and Courtney. The wine was aged for seventeen-months, 30% in new French oak. This Pinot Noir was a classic, with big, ripe cherries, hints of red cassis and a nose of violets and earth and spice. Beautiful fruit, elegantly structured, this was an amazing Pinot Noir. 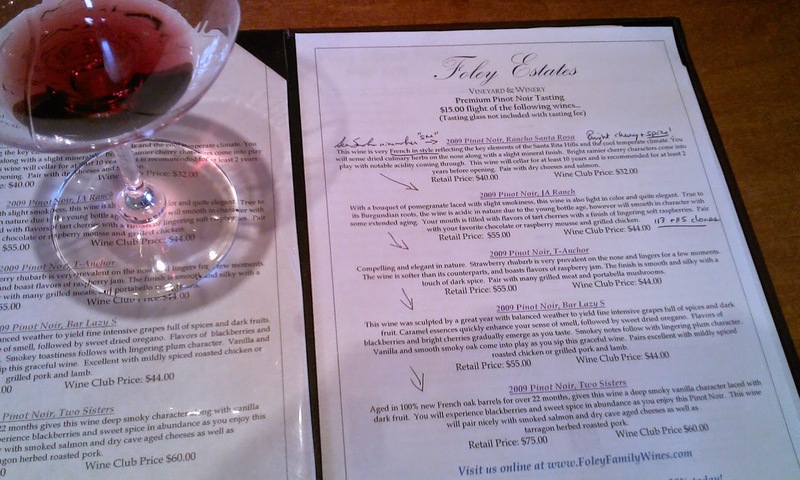 The Foley T Anchor Ranch Pinot noir 2009 is 100% Pommard clone. This is another amazing Pinot Noir. Big, dark cherries and hints of blackberry and blueberry layer in with pepper, vanilla, and other spices. Again, elegant, well structured, and ultimately amazing. 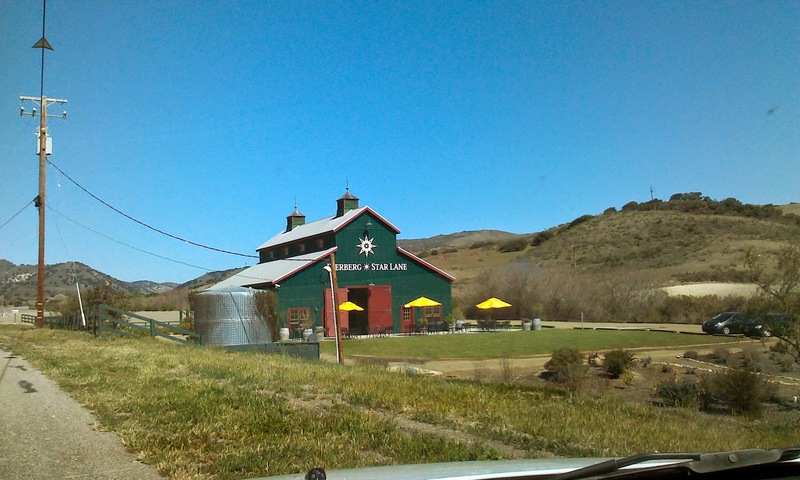 OK, the next one I went to was Star Lane Vineyards. It's rather tricky, because there's three different labels there I'll be talking about: Star Lane, Three Saints, and Dierberg. But it all comes from Star Lane Vineyard. OK, with that out of the way, let's get back to our story. First off, Star Lane is owned by Jim and Mary Dierberg. In 1996, driving upon the former dude and cattle ranch – Star Lane Ranch, Mary Dierberg recalled: “We immediately knew that we wanted this amazing ranch”. With lots of passion, a sense of humor, and some of the best consultants in the business, the Dierbergs planted Star Lane Vineyard with Bordeaux varietals. The family subsequently added two cool climate vineyards represented by the Dierberg wines; creating a collection of superb estates within three distinct AVAs of Santa Barbara County’s winegrowing region. Sauvignon Blanc was planted on the southern end of the Star Lane vineyard. According to the winery, this was where the wine could feel the full brunt of its maritime exposure. This is "where fog and marine influence is most pronounced. The vines grow in calcareous, rocky soils – a base that stresses the vines into producing rich, tropical flavors alongside refreshing minerality." 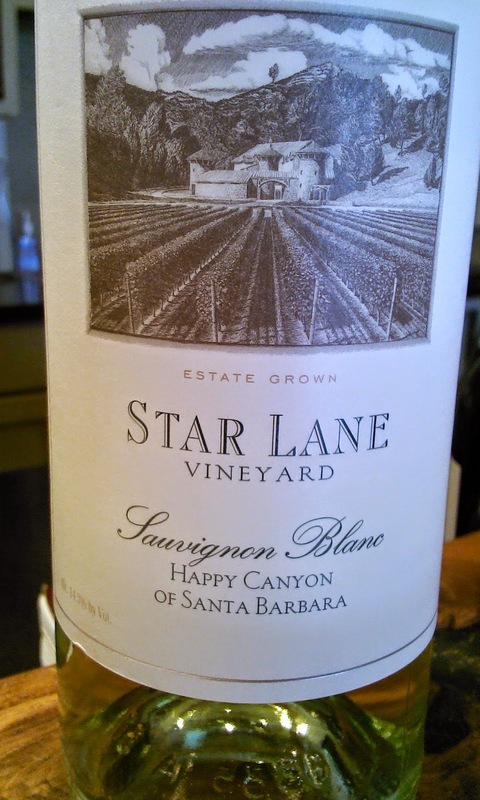 The Star Lane Sauvignon Blanc 2009 explodes with passion-fruit and melon and citrus in the glass. Big whollops of green apples, wonderful citrus, and a nice acidity all blend to make an absolutely wonderful wine. 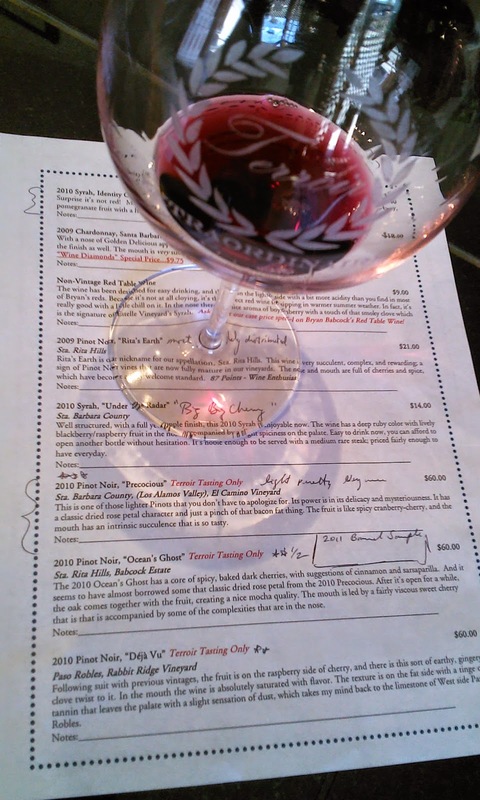 Three Saints Pinot Noir 2009 is a whole berry wine that relies on carbonic masceration. The fruit is destemmed entirely, but not crushed. According to the winery, "The wine is chilled to 55 degrees and allowed to warm slowly and commence fermentation on its own yeast. Secondary fermentation occurs in the barrel. Aged 100% in one year old French Oak from the forests of Bertanges and Alliers. Lightly fined for clarity and bottled without filtration. 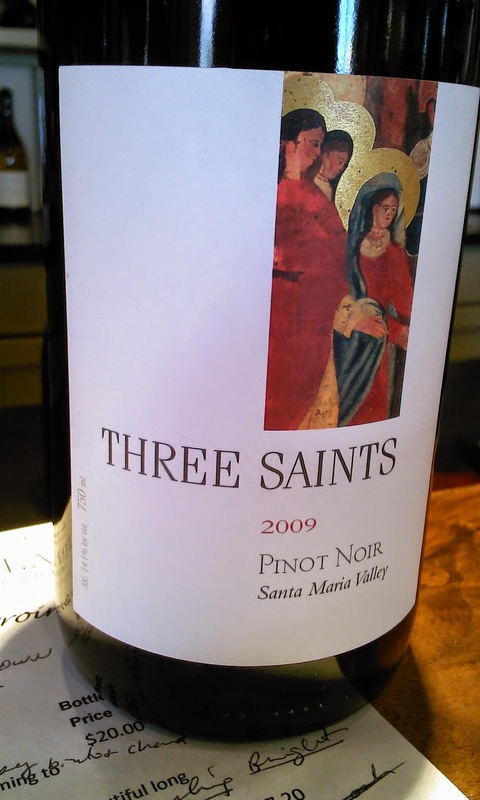 Three Saints Pinot Noir 2009 is all fruit up front - dark cherry, raspberry, strawberry, hints of cherry cola, with a big dose of spices, including a lovely mixture of black and white pepper. The taste lingers a long, long time. Loved it! 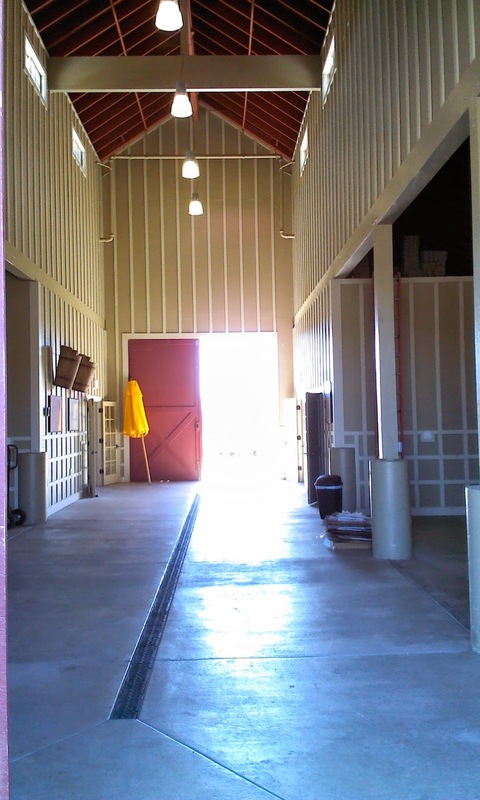 According to the winery, "Dierberg Vineyard is situated atop a sandy loam mesa above the south bank of the Santa Maria River in the western portion of the Santa Maria AVA. Its proximity to the ocean makes it one of the coolest vineyards in the appellation. Slight variations in our free draining soils coupled with 11 different clones of Pinot Noir provide a diversity which empowers our winemaker to make a nuanced and complex Pinot Noir." 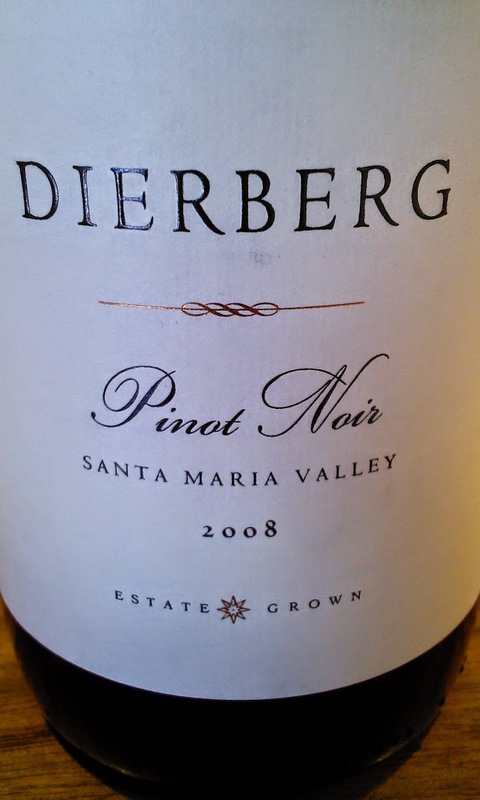 The Dierberg Pinot Noir 2008 is amazing. Big ripe cherries and dark black cherries make for a lovely, lovely wine that is silky smooth to drink. Earth, spice, hints of violets and vanilla. You really feel like you should b reclining on a chaise lounge when sipping this luxurious Pinot Noir. A must have!